Osaka is the third largest city in all of Japan. It is a large city with big skyscrapers, plenty of sights to see, and lots of activities to do. If you are interested in touring large, modern cities while in Japan, Osaka should definitely be on your list! Although Osaka is a large, modernized city, it wasn’t always this way. The area now known as Osaka has been around since the 5th or 6th century, but at this time, the area was not called “Osaka.” As this area developed, it became a large center that connected this part of Japan to the rest of the country. Even today, Osaka is considered the traditional commercial area of Japan. Even though Osaka is a highly modern city, you can still see several important historical sites. One such sight you should definitely make time to visit is Osaka Castle. While this is not the original castle, it still functions as a type of museum and is still worth visiting. There are other museums you can visit in Osaka. Two examples are the Osaka Science museum and the Osaka Museum of History. The science museum has interactive activities and a planetarium. At the history museum, you can learn all about the history of the city. It is best to visit these museums if you have a tour guide or know a native speaker of Japanese. This building is a city landmark which is 173 meters (40 stories) tall. There is an open-air view of Osaka on the observatory deck in this structure, and the view is really nice when the weather is good. In the basement, there is a Meiji-style street with bars and restaurants made to look like the establishments would have during that era. During March, you can watch a sumo wrestling tournament in Osaka’s Prefectural Gymnasium. Sumo wrestling is Japan’s national sport, and it is a very interesting spectacle to observe. 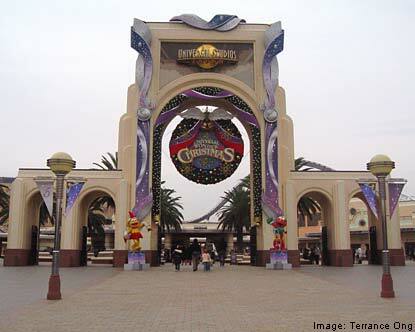 This theme park is one of the largest in Japan. It features many typical theme park rides and attractions. Tickets cost about $6-$7 for adults for a one day pass. Bunraku is a style of puppet show that was created during the Edo period. The puppets are large and very complex; they each require three operators. Puppeteers for this style of theater must train for many years. This particular theater is one of the few places to see live bunraku shows. The plays are all from the 1600s and 1700s. This is a great cultural experience to take advantage of while in Osaka! Okonomiyaki – this is a style of Japanese pancake which may look more like an omelette to westerners. There is often cabbage and other vegetables mixed into these pancakes. Takoyaki – these are fried dumplings that contain octopus. You can often find them in ball shapes. Sometimes, you can see people handing out free samples of these in front of restaurants! Takoyaki is considered a type of “street food” because of the many street vendors who sell it. Don’t worry—you may not trust street food in some western countries, but street food is very popular and safe in Japan! Kushikatsu – these are skewers that contain different pieces of food that have been deep fried. There can be meats mixed in with vegetables and other foods. In order to enjoy some of the best cuisine Osaka has to offer, you should choose restaurants in the Umeda and Dotonbori sections of the city. Nightlife in Osaka is easy to find and very popular. It doesn’t matter what night of the week it is, there is always something to do! There are plenty of bars that cater specifically to foreigners, but there are also nightclubs and other places to go. The Dotonbori area is a huge center for nightlife (for foreigners and Japanese alike). A good foreigner bar to visit is Coolabah. It is known for its friendly atmosphere. You may even see a few locals here who speak some English! Osaka often gets a bad reputation as not being safe. Although this reputation exists, be advised that the city is very safe when compared to western cities of the same size. Japan is overall a very safe country! It is best to avoid the areas of Shinsekai, Tobita, Airin, and Kamagasaki at night. The rest of the areas of Osaka are safe, and the overall crime rates of the city are about the same as Tokyo, which is still low by western standards. Osaka is a great place to take trips to other neighboring cities. It is a good idea to make your hotel reservations in Osaka and travel to the neighboring cities for the day. Osaka is close to Kyoto, Nara, Himeji, and Kobe. You can get to each of these cities in anywhere from 20 minutes to an hour if you stay in Osaka. Osaka is one city you must visit if you are taking a trip to Japan. There is plenty of history, culture, and entertainment to experience, and the city itself is breathtakingly beautiful at night (just go up into the Umeda Sky Building and see for yourself)! Small City Himeji - A Wonderful Getaway!